By Xah Lee. Date: 2012-03-20 . Last updated: 2015-09-02 . How Big is a Pixel? What's Reference Pixel? CSS spec allows 2 interpretations of CSS px unit. As a “reference pixel”. A “reference pixel” is a visual angle of 0.0213 degrees. One way to think of a pixel is 1/16 of a default font size, regardless the device's screen size. For a CSS device, these dimensions are either anchored (i) by relating the physical units to their physical measurements, or (ii) by relating the pixel unit to the reference pixel. For print media and similar high-resolution devices, the anchor unit should be one of the standard physical units (inches, centimeters, etc). For lower-resolution devices, and devices with unusual viewing distances, it is recommended instead that the anchor unit be the pixel unit. For such devices it is recommended that the pixel unit refer to the whole number of device pixels that best approximates the reference pixel. 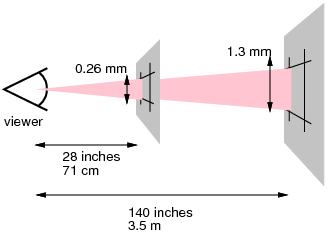 The reference pixel is the visual angle of one pixel on a device with a pixel density of 96dpi and a distance from the reader of an arm's length. For a nominal arm's length of 28 inches, the visual angle is therefore about 0.0213 degrees. For reading at arm's length, 1px thus corresponds to about 0.26 mm (1/96 inch). Around 1998, web design assumes 640×480. Around 2005, web design assumes 800×600. Around 2012, web design assumes 1024×800. Here's a bunch of articles addressing issues related to screen density.